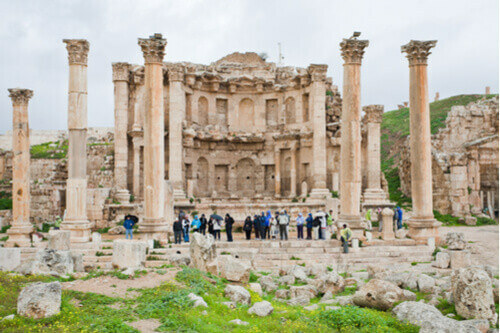 For many people, a visit to Jordan revolves around the lost city of Petra, however tourists that venture past the southern attraction will be delighted with marvellous sights like Jerash. 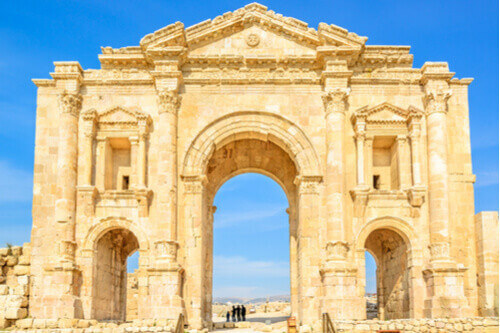 Dating back thousands of years, the city of Jerash is a fusion of modern and ancient, with the towering Arch of Hadrian dividing the old parts from the new. 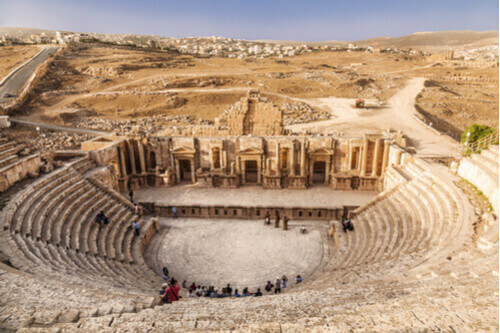 Located in northern Jordan, just 50km from the capital Amman, this ancient Roman city is one of the best preserved outside of Italy and boasts greco-roman ruins as grand as any around the world. 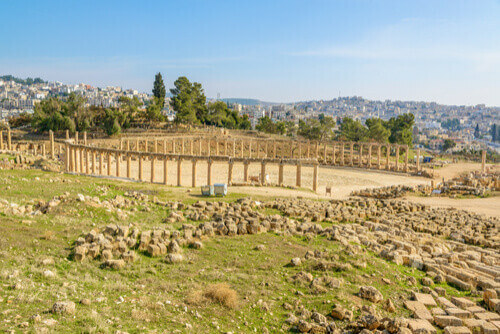 Such was its significance in history, Jerash — known then as Gerasa — is mentioned in the New Testament as one of ten cities making up the Decapolis (group of 10 Greco-Roman cities). Tucked into the rolling hills of the Jordanian desert and surrounded by farmland, the spot seems an unlikely location for a major Roman metropolis. 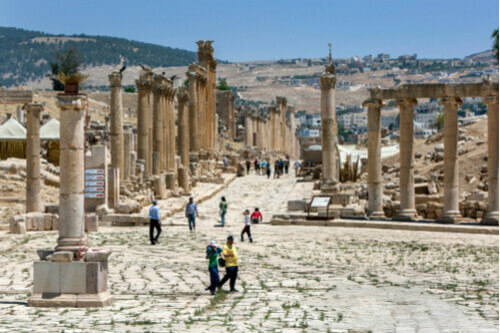 However, Jerash was situated along an essential trade route and thanks to the continual flow of goods and people, the city boomed for hundreds of years. In its heyday the population swelled to 20,000, but as with many ancient middle eastern cities, it was hidden under mountains of sand for centuries and required immense excavation. While archeologists have uncovered human remains, such as skulls, dating back to the neolithic period, the city really began to flourish after being conquered by Roman General Pompey in the first century BC. The money and man-power of the Roman empire enabled the construction of grand infrastructure projects, many of which have been preserved and are still visible to tourists today. This architecture is reminiscent of Petra, but has a distinctly Greco-Roman feel. When you arrive, step through the South Gate and take your time inspecting the elaborate corinthian-style carvings at the top of each column. Continue down the dusty path through the ancient city as many Romans did before you. Eventually you’ll come to the sprawling Oval Plaza, previously used as a market and meeting place. The wide space is surrounded by almost 60 limestone columns and is a great place to rest and take in the history of the area. Another highlight of Jerash is the Temple of Artemis. The structure was erected in the highest part of the city as an homage to Artemis — goddess of fertility and daughter of legendary Zeus — because she was the city’s patron. Eleven beautifully carved columns mark the entrance to the temple and glow golden in the Jordanian sun. Experts speculate it would have once been covered in marble and filled with precious statues of Artemis, however these and many other artefacts have been lost over time.